Sandwell forms part of an area in the West Midlands which is popularly referred to as the ‘Black Country’. This area industrialised rapidly during the Victorian period and, with the building of many new factories came the building of many new houses for workers. A good number of these Victorian properties survive, complete with original Victorian tiled floors. However, homeowners aren’t always aware that these tiled floors exist, since they have often been covered up by carpet or linoleum. 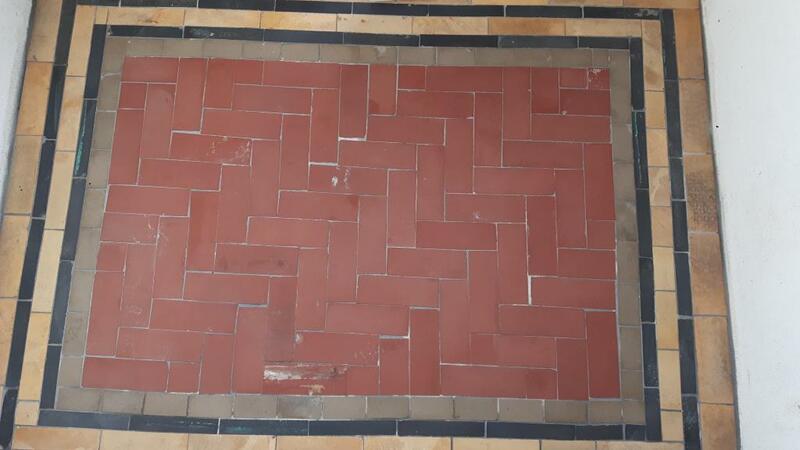 We find that when new homeowners discover these original tiles, they are usually keen to restore them to their best possible appearance. This requires professional assistance. 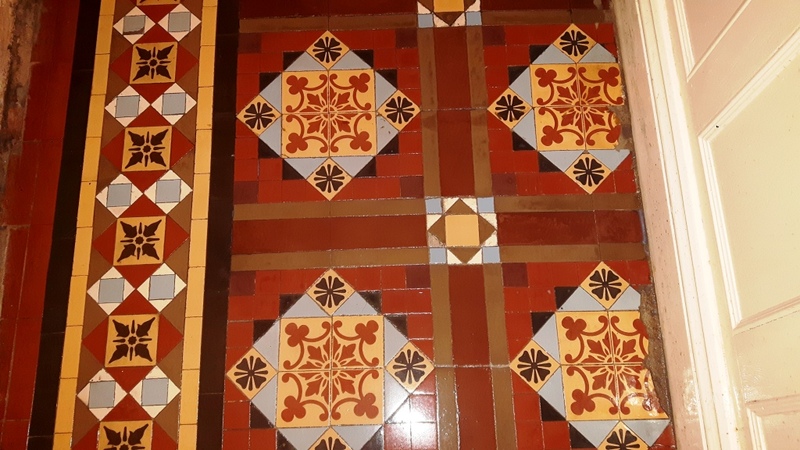 A customer who lives in the Warley district of Sandwell recently contacted me about the restoration of a 120-year old Victorian tiled hallway that they had discovered underneath an existing carpet. As expected, the tiles were caked in deposits of adhesive, cement and paint which had accumulated over several years. Making matters worse, the customer had also spilt more paint on the tiles during decoration work. 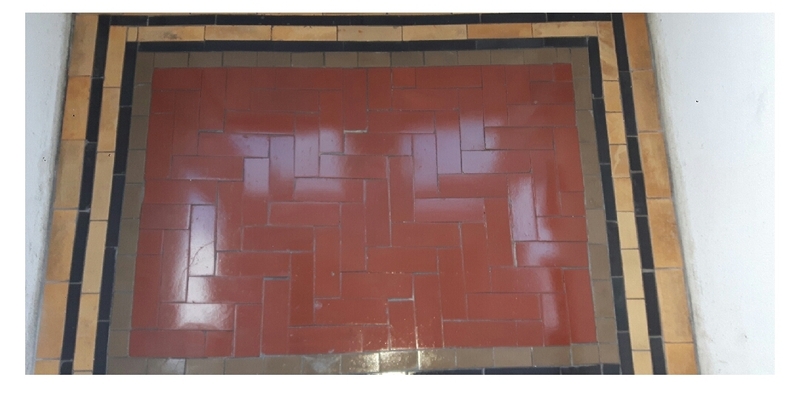 I began the restoration by cleaning the tiles with Tile Doctor Pro-Clean, a strong alkaline cleaner which is perfect for removing grime from heavily soiled and neglected natural stone. The product was applied liberally across the area and left to dwell for a short period. It was then worked into the tiles using a specialised rotary cleaning machine fitted with a black scrubbing pad. The now soiled cleaning solution was subsequently rinsed away and the floor then rinsed with clean water. Stubborn paint marks and cement were carefully scraped off the tiles by hand. A solution which combined more Pro-Clean and Tile Doctor Remove and Go (a stripping agent) was applied to the tiles to help remove any old and now ineffectual sealer, as well to fully remove any of the particularly stubborn marks. After being worked in again with a scrubbing pad fitted to a rotary machine, the excess cleaning product was rinsed away using water and the floor was dried off with a wet vacuum. As tiles of this age were usually laid without a damp membrane in place underneath them, they can be especially prone to efflorescence (salt) deposits. To help prevent this, Tile Doctor Acid Gel, which is a combination of phosphoric and hydrochloric acids, was applied. This will help to neutralise any alkaline salts that might threaten to penetrate up through the tiles to leave unsightly white marks. After the floor was rinsed once again, I proceeded to re-grout a few areas of the floor where the grout had worn away over the years. Once I was happy with the clean tiles and fresh grout, I left the floor to dry off overnight. The next day the tiles had thankfully dried completely and were ready to be sealed. Since the customer had requested a sheen finish, as opposed to be a natural matte finish, I opted to use a combination of two different sealants. The first to be applied – to bring out the colour in the tiles – was Tile Doctor Colour Grow. This product impregnates the tiles to protect them against ingrained dirt, but it leaves a matte finish. Therefore, I added five coats of Tile Doctor Seal and Go to provide not only extra protection, but also a high-quality sheen finish. I left the customer, who was delighted with the results, with a bottle of Tile Doctor Neutral Tile Cleaner. This product will serve as a reliable cleaning product for the routine maintenance of the tiles, ensuring they continue to look fantastic. Fantastic service. Cleaned our old quarry tile floor and coloured slate kitchen floor. They now both look great and very little mess and disruption during the cleaning. Prompt response to my inquiry. When Kieron attended to quote a price he also demonstrated the effect of the cleaning method. The replacement tiles are a good match to the originals. I’m pleased with the result. Kieron responded quickly to my initial call and visited to prepare a quote within a couple of days. I wasn’t in on the day he did the work but he collected a key the day before, let himself in, carried out the work agreed, then locked up and left. 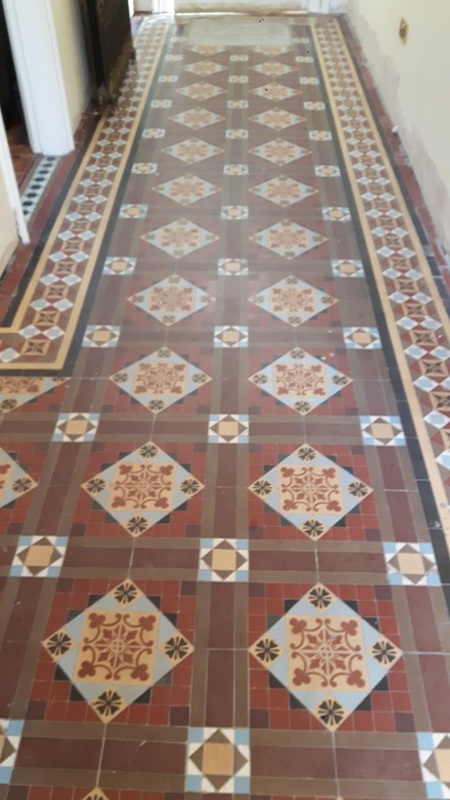 An excellent renovation of some tired and damaged victorian floor tiles. Kieron was very professional and provided a great service. I am very pleased with the result. My floors look unbelievable, very pleased. I can’t believe how hard Kieran worked. Superb service, highly recommended. Very knowledgeable, explained everything and was very thorough. Keiron was fantastic, very knowledgeable and friendly. I’m over the moon with the work he did on the stone floor in our new house. I had no idea that it was a light coloured sandstone floor, I’d thought it was dark brown slate before he came over and gave it a proper clean! Would definitely recommend to anyone considering having a professional floor clean. Its made a huge difference to our home and will last for years.